Our target for the day was Gulcha, 85km away, the far side of the 2,389m Chirchik Pass. 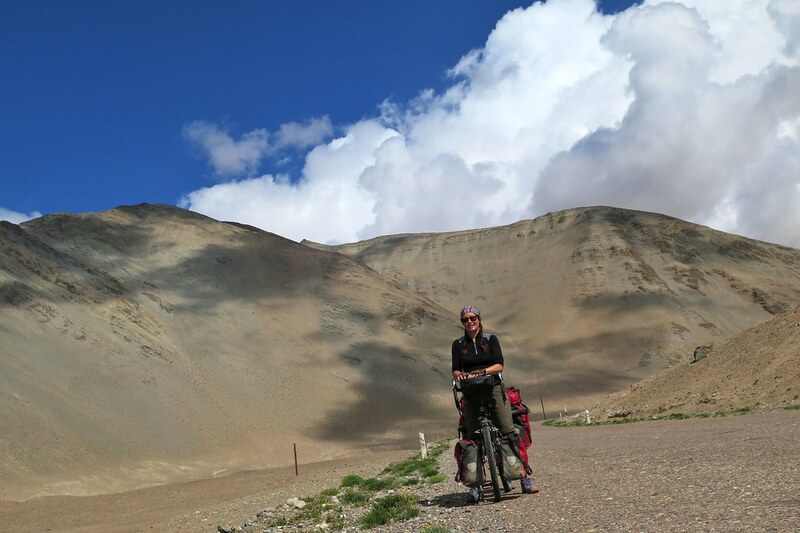 We had been steadily gaining altitude all day, but once we were closer to the pass, the road got steeper. 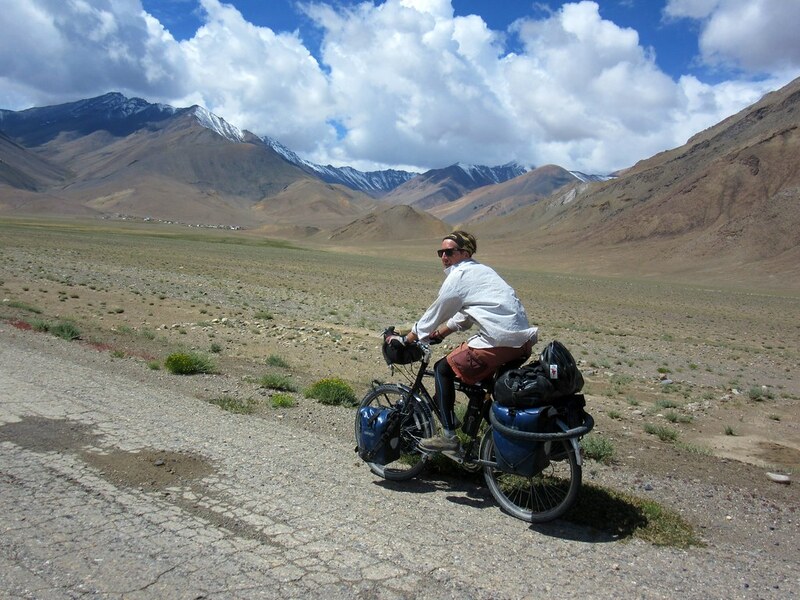 It was quite a tough and hot couple of hours slowly climbing up into the mountains past farms and yurts. A mere taster of what we had to come. By mid afternoon we reached the top and were stopped by a group of kids for a chat and some photos. Then we had a very easy coast down the other side for our final 15km to Gulcha where we found a guesthouse for the night. It was quite expensive, but it was the only place in town, and it had wifi, our last chance to check Facebook for a few weeks, so we were happy to hand over our Som. The next day after a decent brekkie we hit the road again, filling up on water and petrol for our stove on our way out of town. We would continue on the M41 up the valley all day, towards the next pass. 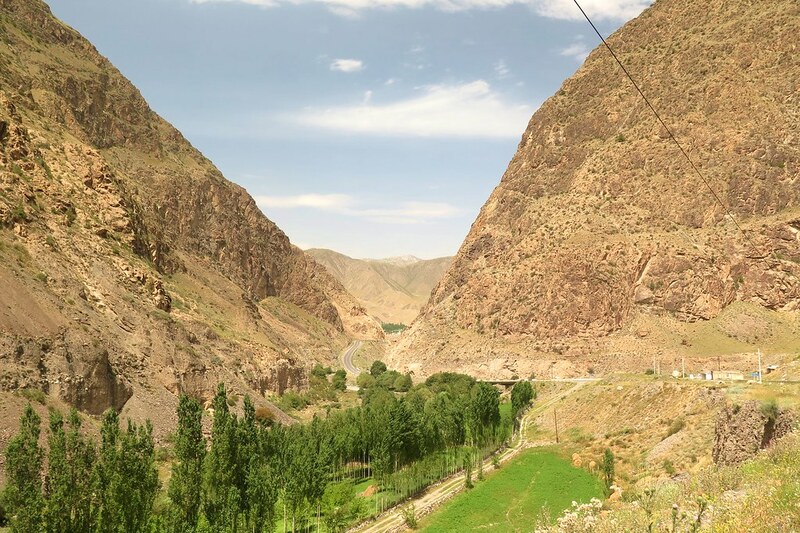 The mountains around us were getting rockier and more arid, making a beautiful contrast with the green vegetation close to the river. We had a tailwind helping us up the mellow climb but we still took plenty of breaks to rest our legs which had taken a bit of a beating on our first day out of Osh. After lunch the weather closed in a bit and we had a few drops of rain. 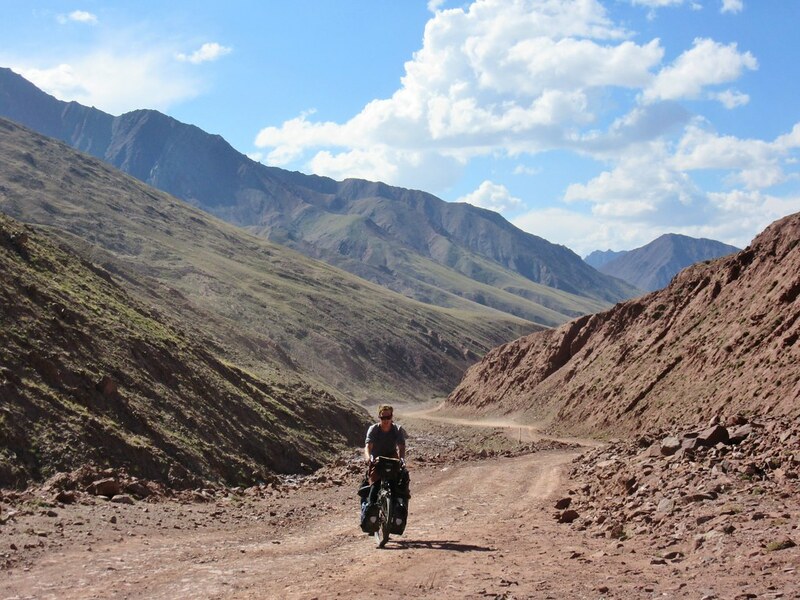 We came to a few zig zags and a short, sharp up and over which took us on to a plateau at 2,400m. We spotted a grassy area next to the river and decided to get the tent up before the rain really arrived. Lucky timing, as the thunder started and heavier rain came in soon after we had set up camp. It was a good place to stop, a few kilometres short of the start of the next climb which we’d tackle the next day. We had rain in the night, but blue skies and amazing views when we woke in the morning. We packed up and hit the road, which led uphill through gorgeous alpine meadows to the base of the switchbacks of the Taldyk Pass. It was a beautiful morning and we were feeling good for the climb. 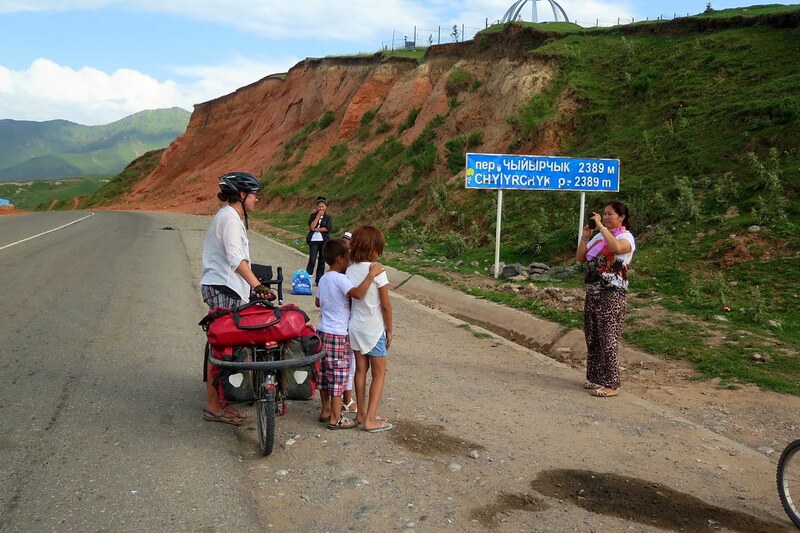 Along the way we had numerous hellos and bye byes from kids beside the road. Some would come out in the road to stop us and ask us our names or where we’re from in basic English. As usually happens once the gradient increases, Clare started to edge ahead of me as we settled into our natural climbing speeds and started gaining more altitude. After a couple of hours we were near the top. We were surprised to be passed by a blue Nissan Micra with UK number plates. We shouted hello and they pulled over for a chat. Damien and Crystal had driven here from London, with a rough plan to continue overland (and sea!) to New Zealand. While we were talking, some Belgians on motorbikes pulled over to say hi, quickly followed by some French cyclists. Then we were joined by a Belgian family travelling in a van with their kids. A very cordial European gathering on a random Kyrgyz mountainside, we can still all be friends, right?! A nice chat and an excuse for a break, then we were back on it for the final few hairpins to the top of the pass at 3,615m. We set off down the far side, looking forward to a long smooth downhill and feeling pretty good to have conquored the pass, our highest so far. But we rounded a corner to be faced with another climb! A second pass that we’d forgotten about, so we were back into climbing gear and back up to 3,550m before we could enjoy the downhill for real. It was worth it though. 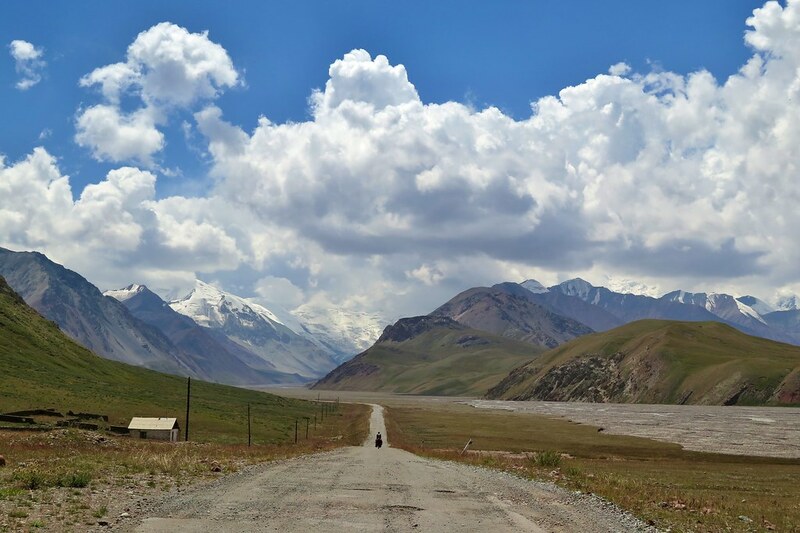 As we descended, the valley opened out to give us views down to Sary Tash and across the plain to the Pamir mountains proper, dominated by Peak Lenin. Riding down, I was pretty choked up to see this incredible vista with my own eyes. 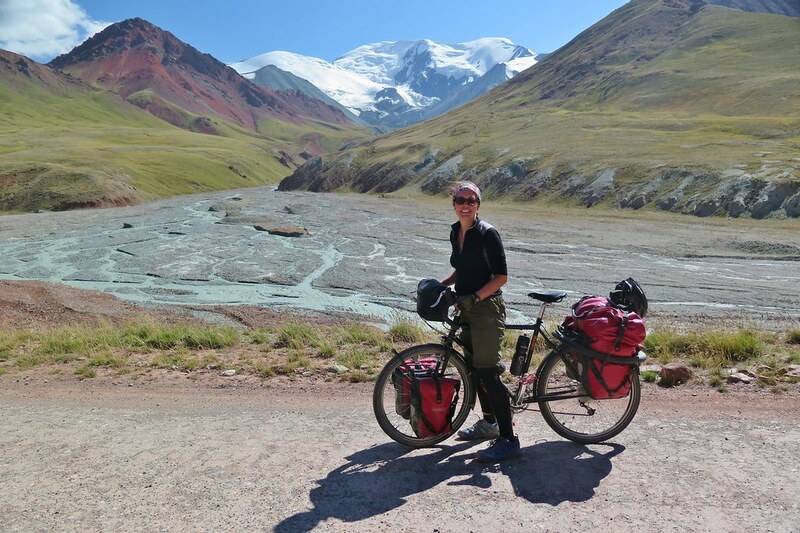 I’ve seen it in so many photos and cycling journals. This is what I’ve been looking forward to the most on this trip. 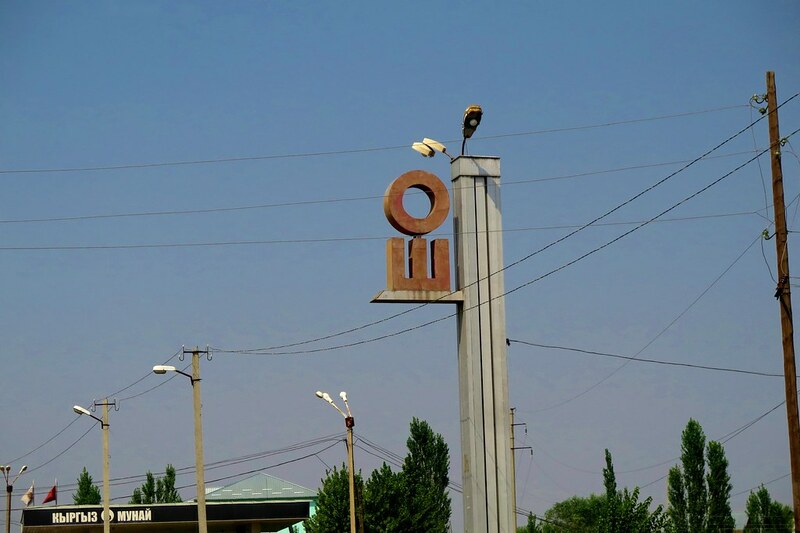 We got into Sary Tash and found a guesthouse and a magazin for some more supplies. As the evening wore on, the temperature dropped and the wind picked up. We were very glad to have a warm room for the night. Later we were joined by Kim, who’d made it over the pass just as the weather was closing in. We had a good dinner and a solid night’s sleep, our last in Kyrgyzstan. With the first 4,000m pass ahead of us, we have to get on with it. We turn a corner and say goodbye to the ashphalt, seeing the track ahead climbing up towards a distant ridgeline. We’re getting deeper into the mountains now, with huge glaciers around us on both sides. The colours are incredible, the rocks are red and grey, the water in the stream is a strange milky green colour. All the visual excitement is a good distraction from the hard work of turning the pedals and keeping the wheels straight on the bumpy road. 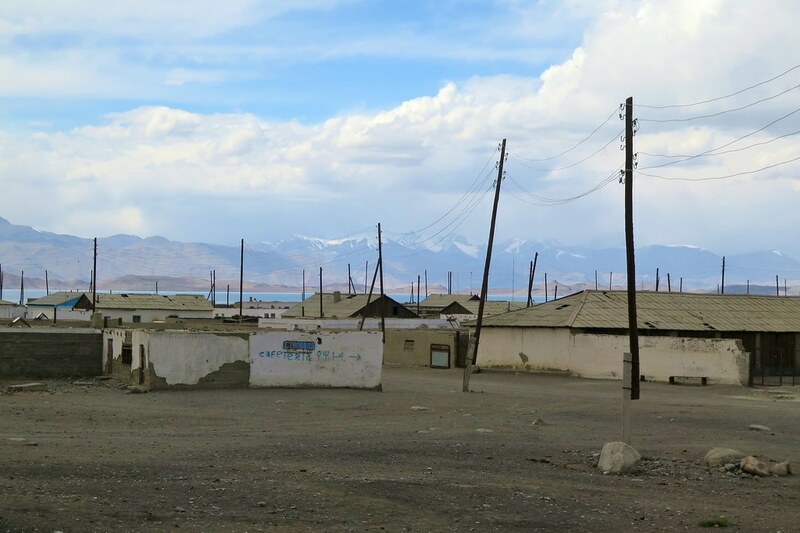 We reach a small building at about 4,000m where a guy comes out to say hello and offer us a place to sleep as the day is wearing on. 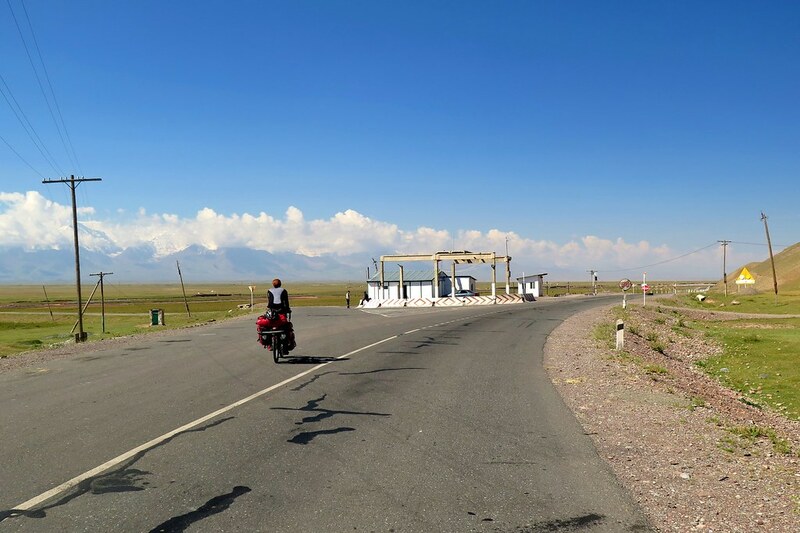 We decide to continue, aiming to get to the Tajik entry checkpoint. 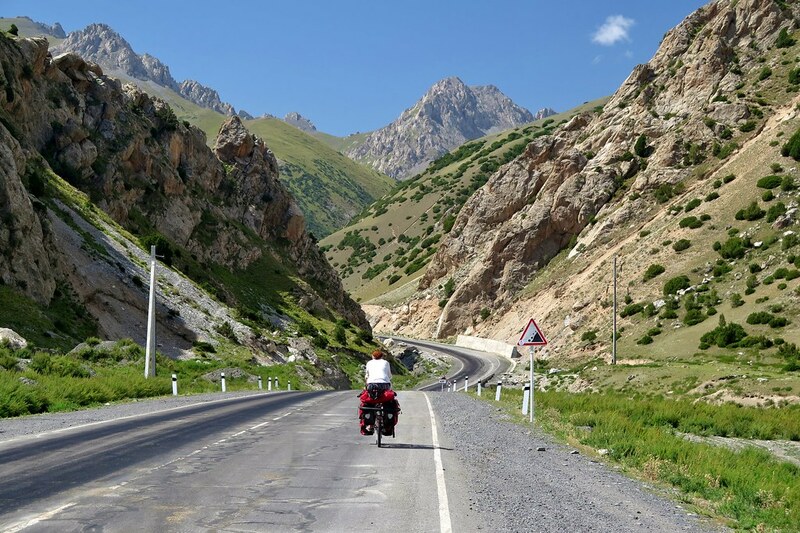 The final few kilometres to the pass are a set of steep hairpins which get us up, very slowly, to the Kizil-Art Pass, 4,280m. 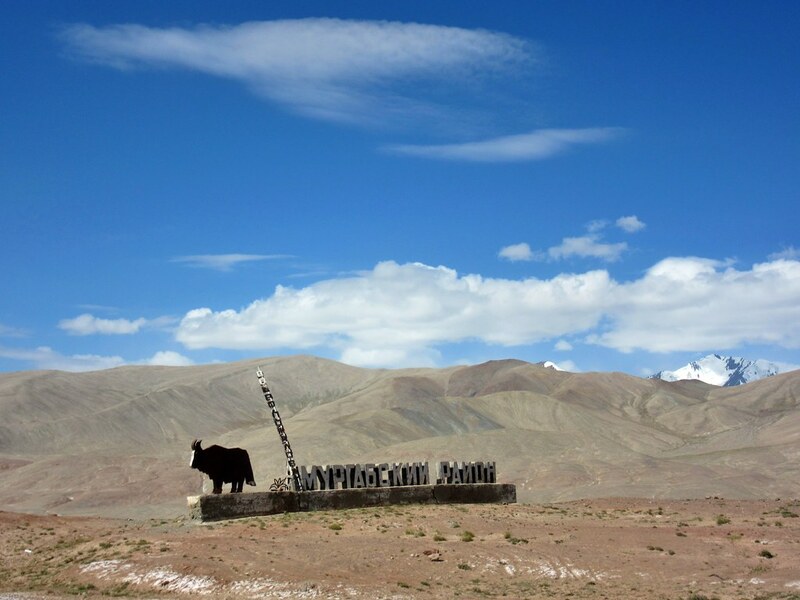 It was another ‘pinch yourself’ moment for us as the famous Marco-Polo sheep statue came into view at the crest of the climb. This was the highest either of us had ever been. We breathlessly hugged and set up the camera for a slightly wonky photo. 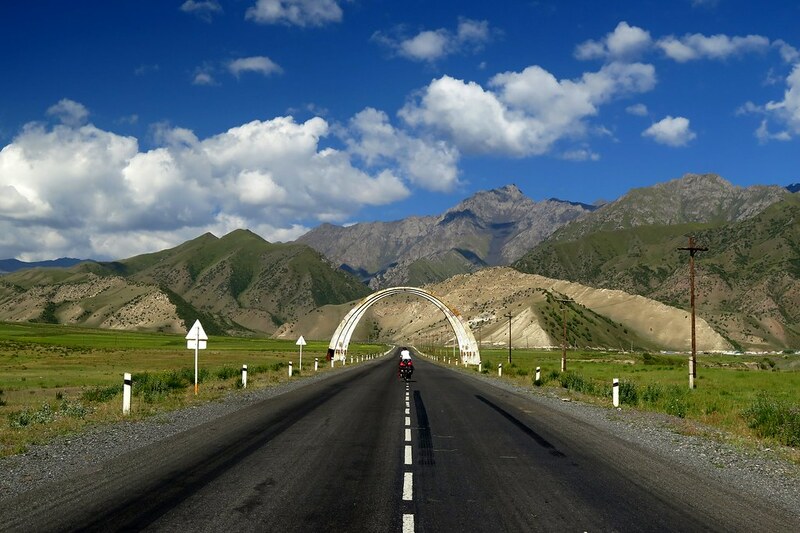 It had just ticked past 6pm when we started down the far side of the pass, where we found the Tajik checkpoint closed, so we camped just below the road, ready to enter the next day. We were at over 4,100m and neither of us slept particularly well, probably due to the altitude. The mantra is ‘climb high, sleep low’ but with the border closed, we didn’t have any other option. It was a chilly night but we were warm in our sleeping bags, just a little slow to get out in the morning! 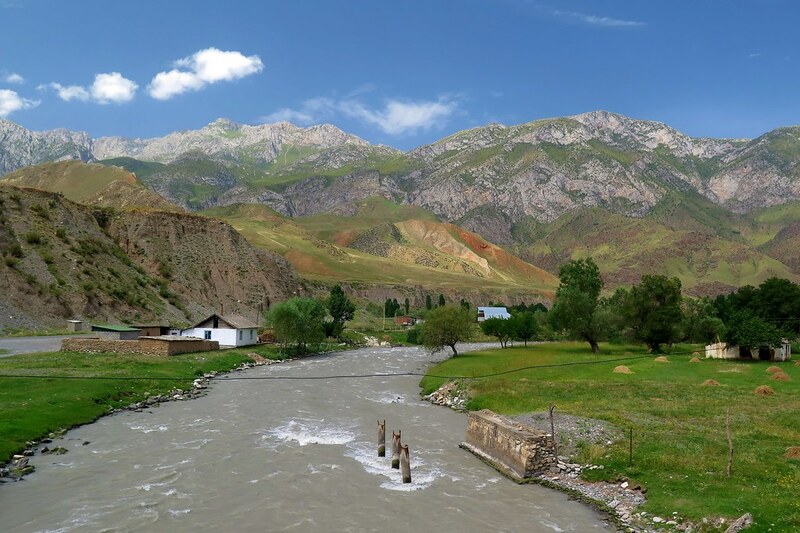 Once the sun hit the tent we were up and away to the border where we were welcomed and passed hassle free into Tajikistan, country number eleven. 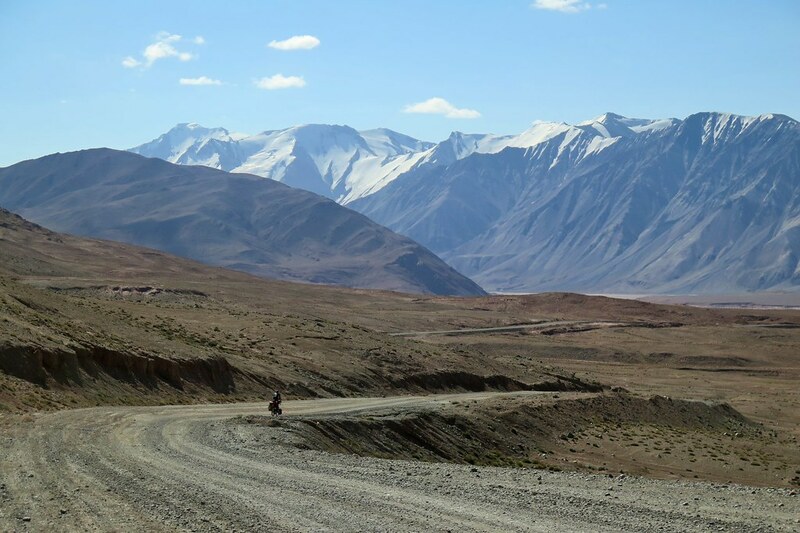 Initially we were still on quite a bumpy dirt road, descending a few hundred metres onto a wide barren plateau. This is where I’ll start sounding like a broken record, but the views were truly out of this world, more incredible than the any photo can do justice to. The road was back to asphalt, cutting a long straight line across this trippy high-altitude desert. Further on, we started to gently climb again. 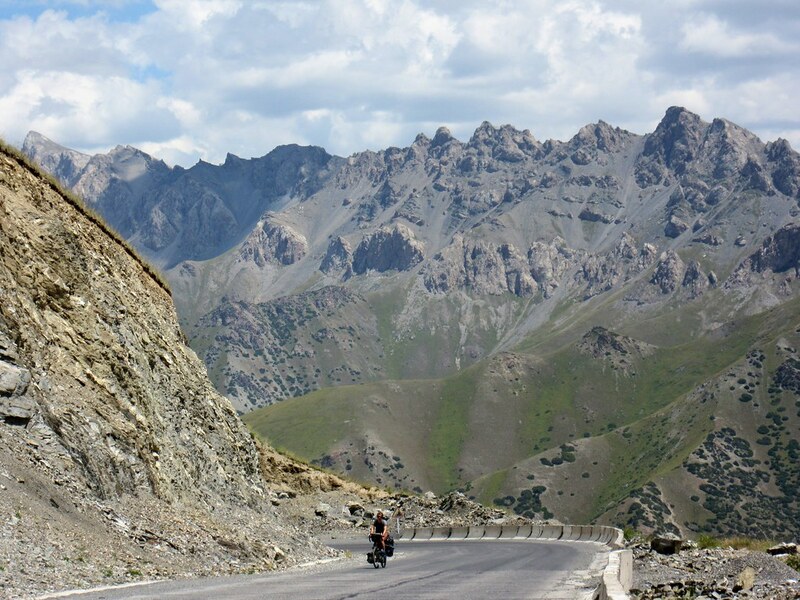 It wasn’t a major one, just a few hundred metres gain to get us up and over the unmarked Uy-Buloq pass at 4,232m. 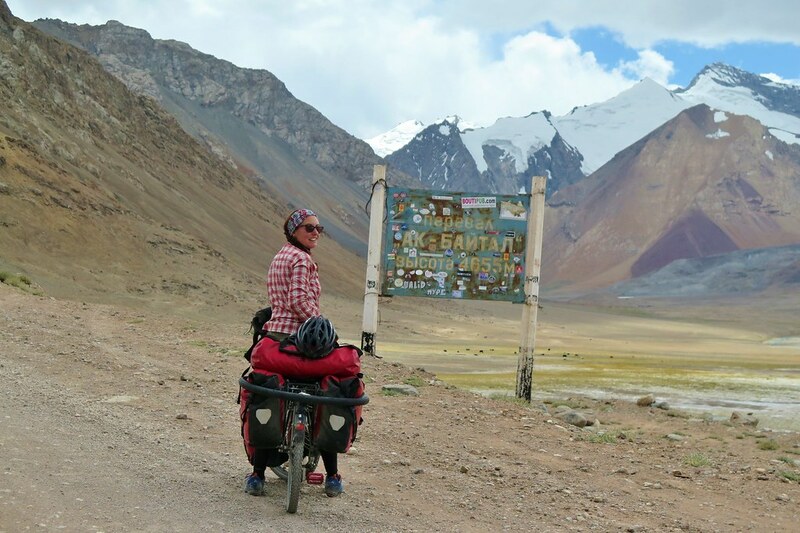 From the top we coasted down towards Karakol, a huge lake lying slightly below us at 4,000m. 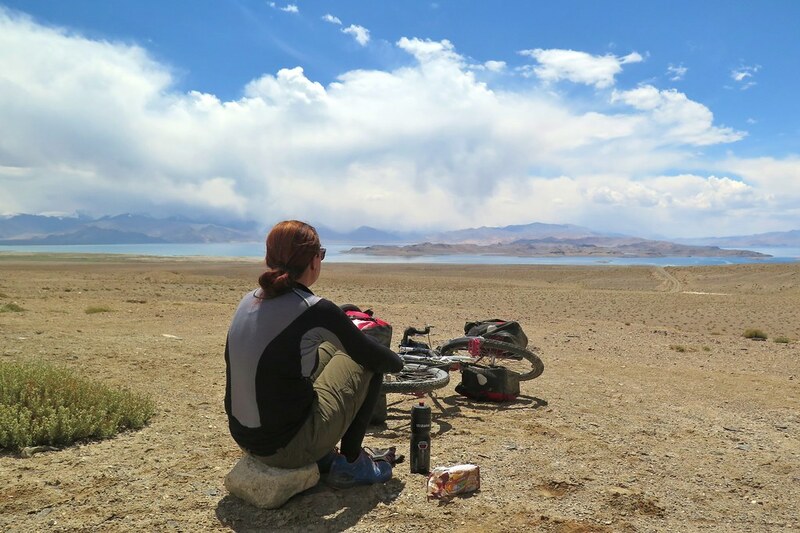 We stopped for a lunch break to enjoy the view, then continued the 25km around the lake towards Karakol ‘town’, the only settlement for miles around. 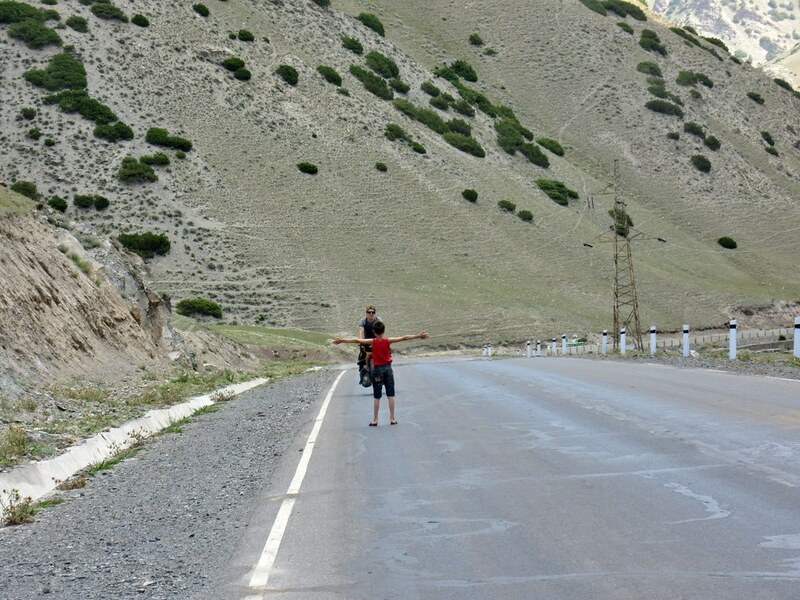 On the way, we met Adam, from Liverpool, who is walking the Pamir Highway carrying everything he needs in his backpack. 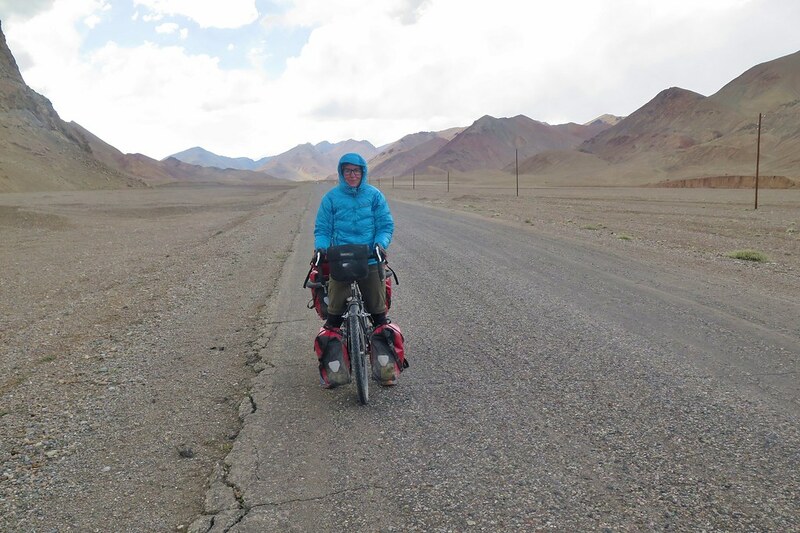 He was the most cheerful traveller we’ve passed for a while, looking forward to finishing his epic trek at Osh, ‘only’ a couple of hundred kilometres away! 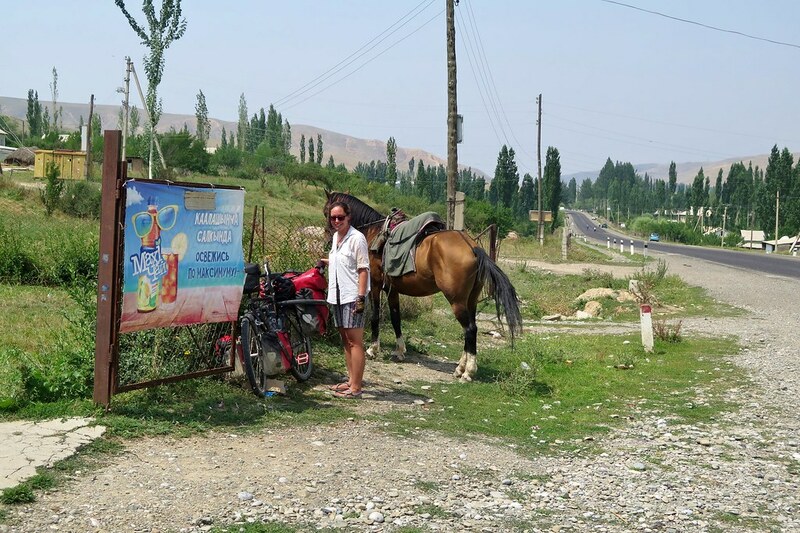 At Karakol, we found a small magazin, whose shelves were devoid of almost anything edible, but we bought a Coke each and some water. With the clouds coming in and the wind whipping in over the lake, the small group of low buildings felt especially bleak. Winter must be tough up here. We pushed on out of town trying to beat the weather, but after about 10km the rain started falling. After a few duds, we found a decent place to camp, next to a stream and slightly sheltered from the wind. We managed to cook some dinner between showers, then read for a while in the tent before falling asleep. Overnight, the rain continued, which was a concern as the next day we would be climbing much higher, to where any precipitation would most likely be sleet or snow. By the morning, the clouds started to break up, giving us amazing views of the distant peaks, and the nearby hillsides which were covered in a dusting of snow. We were away quickly, to take advantage of the break in the weather. But as we moved on, the clouds cleared more, revealing a deep blue sky. 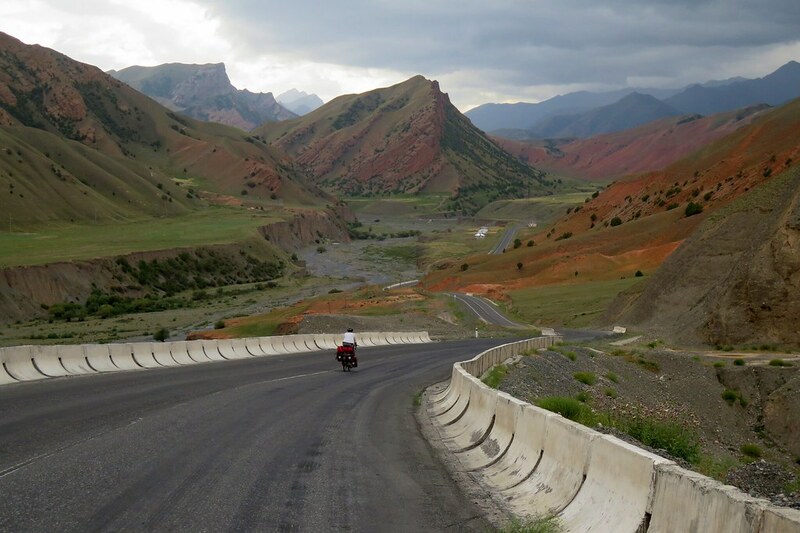 For a while we still had a good road surface and we made decent progress into the next valley. But then the asphalt came to an end and we were onto an awful dirt road, the washboard surface slowing us to barely 5km/h. We bounced along, cursing the road for another couple of hours. 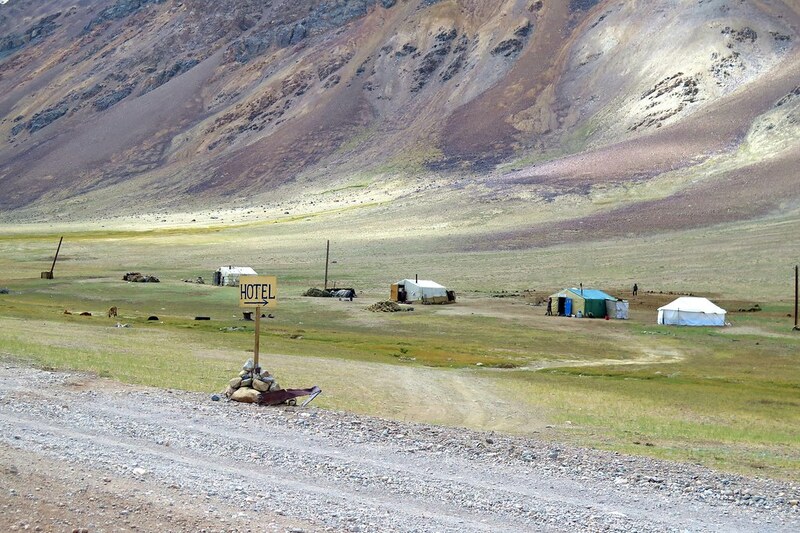 On our right side was a collection of small huts, and a signpost for a hotel – The ‘Grand Hy-yurt’. (Thank you. I came up with that one myself.) There we met a Swiss cyclist who told us the dirt continued up to the top of the next pass, but it did get smoother a few kilometres ahead. Good news and bad news I guess? 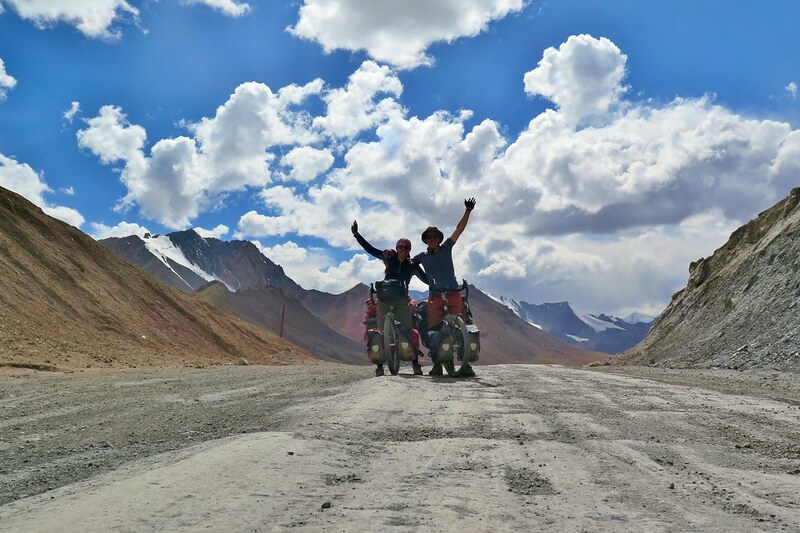 This was the big one, the Ak-Baital Pass, 4,655m, the highest point on the Pamir Highway, and the highest we’ll be on this trip (and probably ever with our bikes). An intimidating initial climb took us past the sign for the pass, frustratingly still several kilometres and a few hundred vertical metres away. 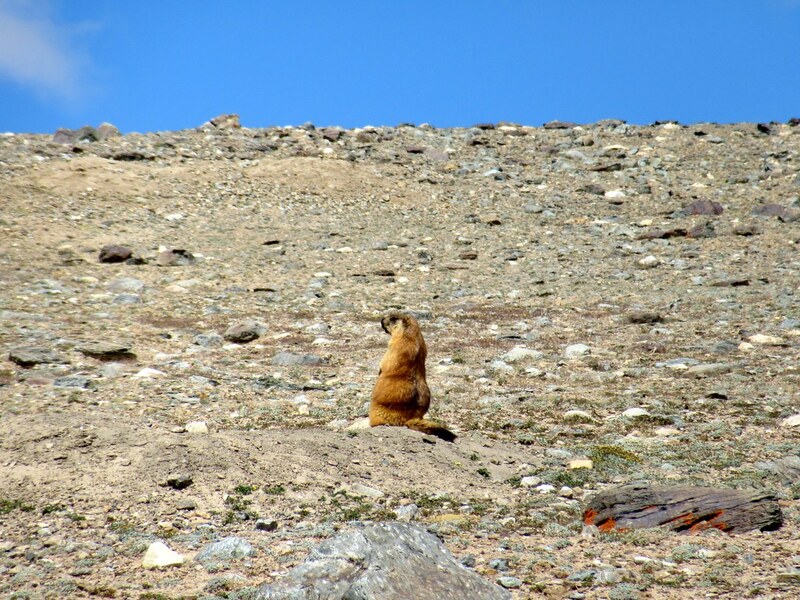 Slowly we reached a point where the gradient mellowed and we were into a crazy rocky valley, with only marmots for company. 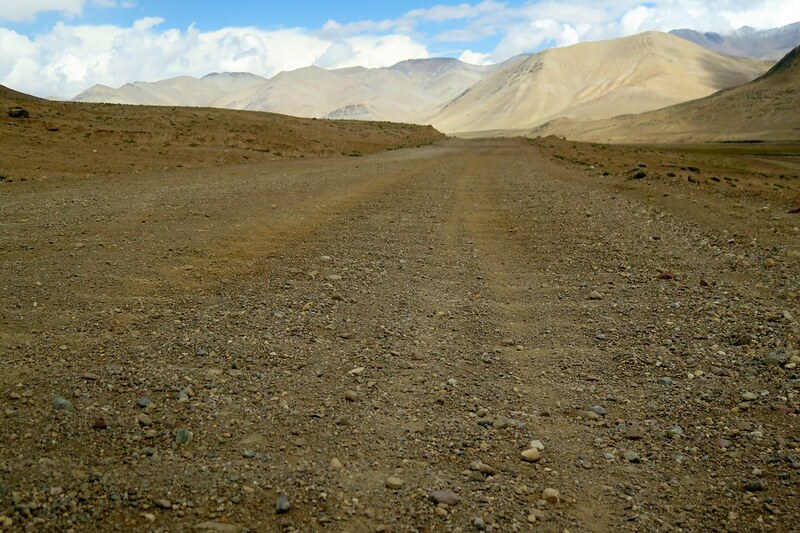 The road continued gently up past the bleak brown mountainsides. Thanks to the improved surface, we could take it easy, keeping our breathing under control despite the increasing altitude. The final steep section came into view and a last push got us up to the point where the road levelled off and started descending. There was nothing to mark this momentous (for us) place, it was just like any other dirt road. 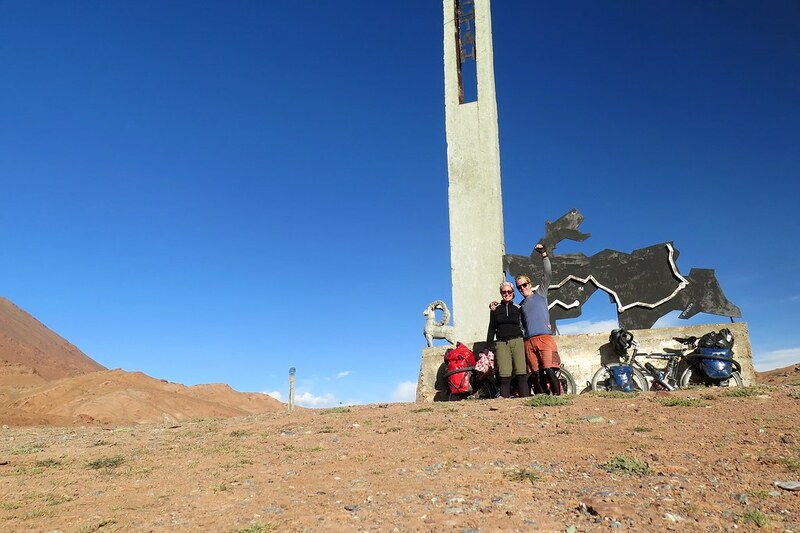 We were jubilant to have reached this literal and figurative high point, celebrating with a big hug and of course, another wonky photo. The far side of the pass was cold. After a few minutes we stopped to put on our jackets and gloves to continue the fast descent, especially so now that we were back on to asphalt. 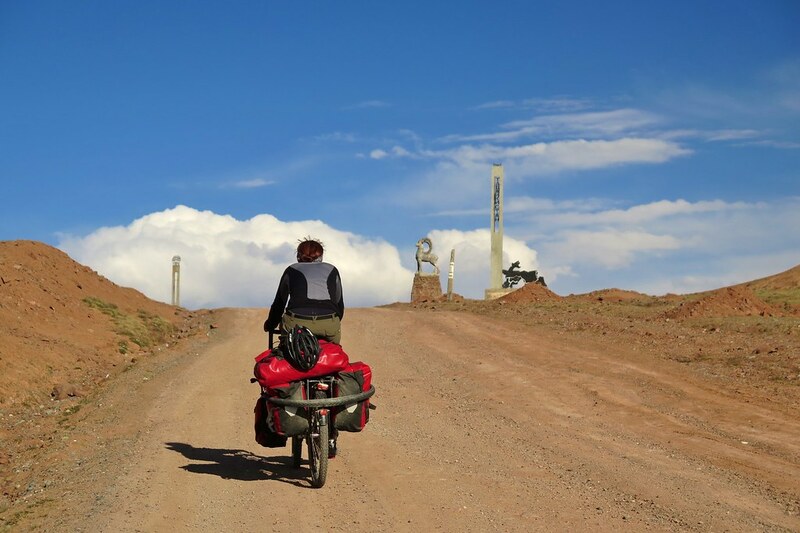 We were keen to take advantage of the downhill and get us much distance done before stopping, to give us a shorter day the next day to get to Murghab. 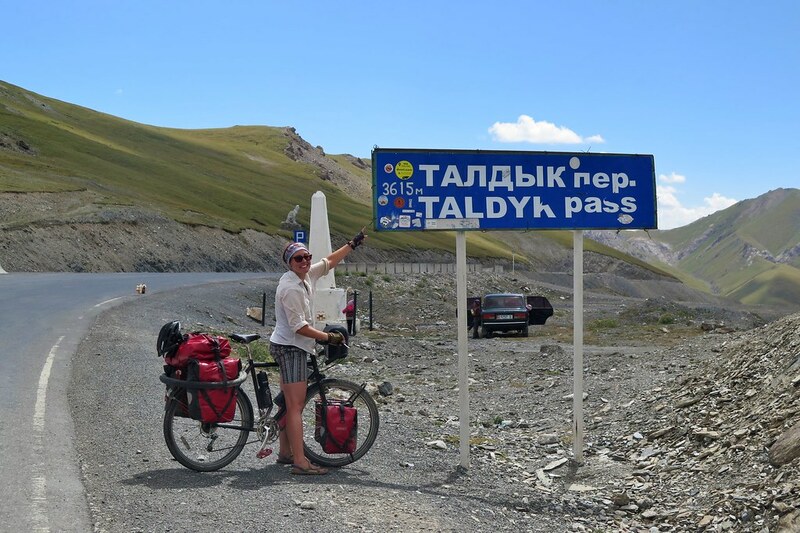 On the way down, we passed an Italian cyclist who had taken a bus from Osh to Karakol – 900m to 4,000m altitude gain in one go. He wasn’t having a great time of it, but the only thing he could do was get to lower altitude. 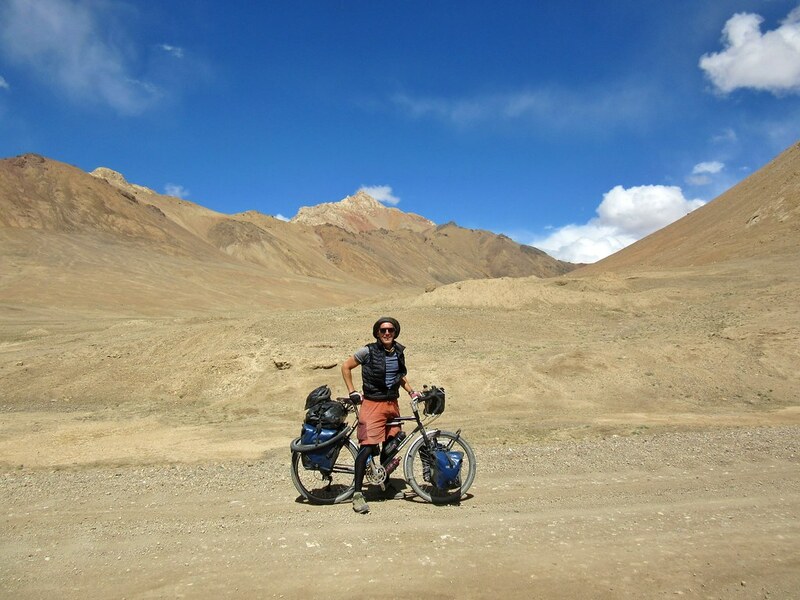 (We saw him the next day in Murghab, looking much chirpier) We stopped for the day after 72km in a great spot next to a river. We thought we were totally alone, until we saw a lone figure walking towards us. He was clearly not a local, dressed in a technical jacket and bright hiking shoes. 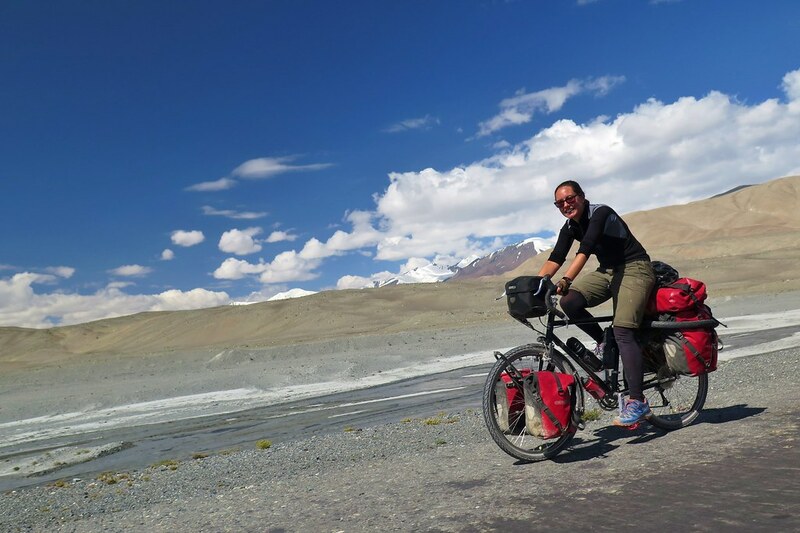 He turned out to be an Austrian cyclist who had already pitched camp just upstream and heard us discussing where to put our tent. It was another rainy night and clear morning. 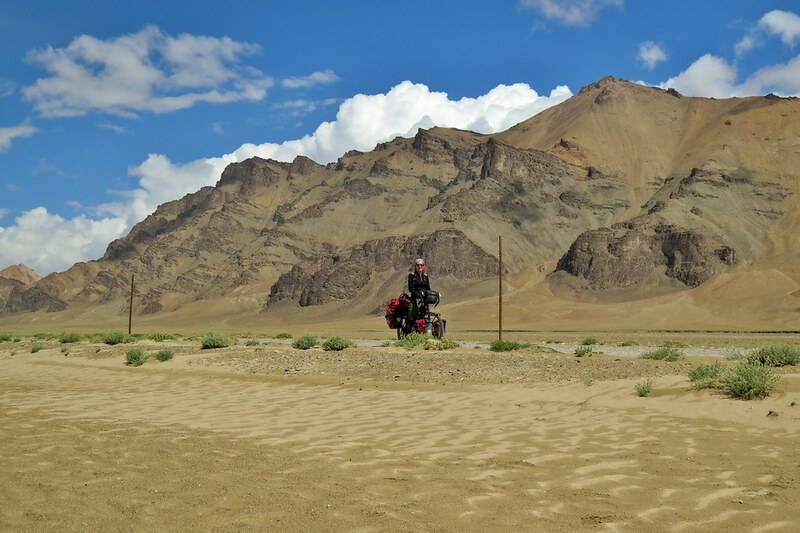 We had left ourselves 48km to get to Murghab, all on sealed roads and mostly downhill. In high spirits and enjoying the views we rode chatting through the morning. Again, broken record, just unbelievable scenery all around us. 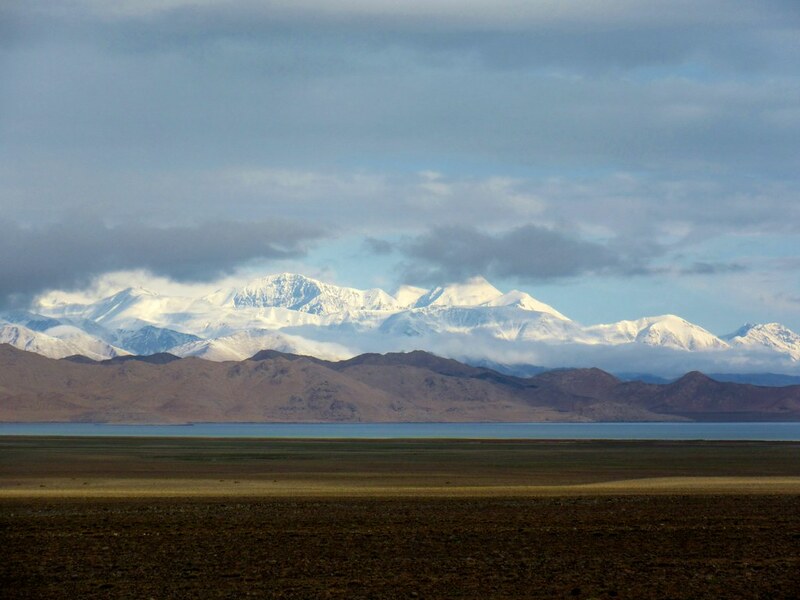 Every gap in the mountains would reveal distant snowcapped peaks, standing out so vividly against the blue sky and red rocks. We passed a few European registered cars, mostly old bangers, competing in the Mongol Rally, a race from London (I think?) 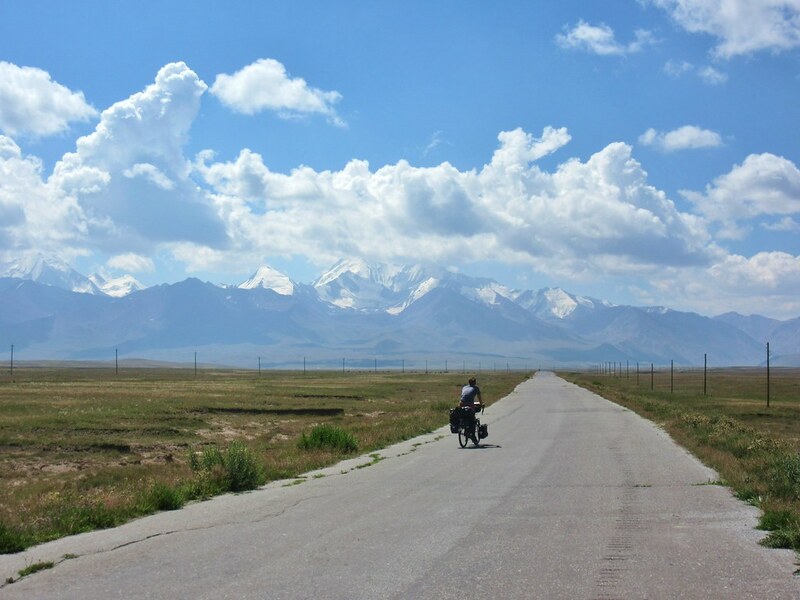 to Mongolia. 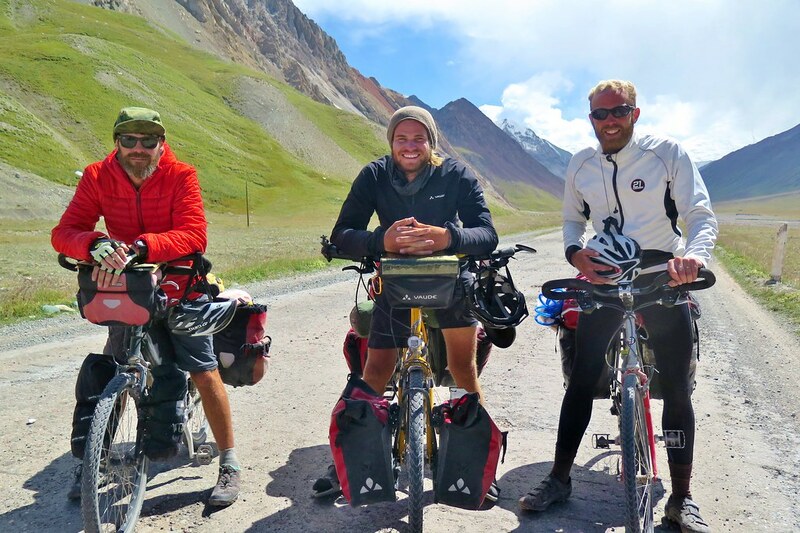 We chatted to one British team, they’d made it this far in about 20 days. Crazy, it’ll take us nearly another year before we’re back in the UK! We made good time, even with a little tea and biscuit break. 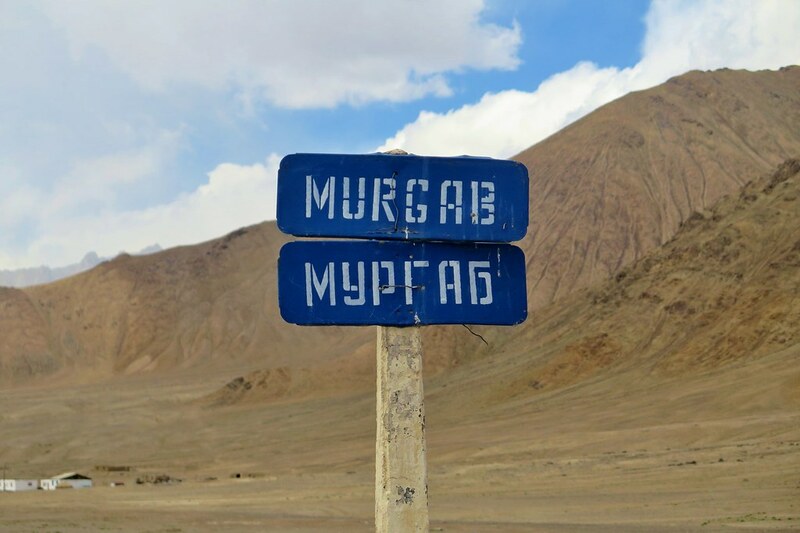 By lunchtime, we were just outside Murghab, the largest settlement in this part of the Eastern Pamirs. 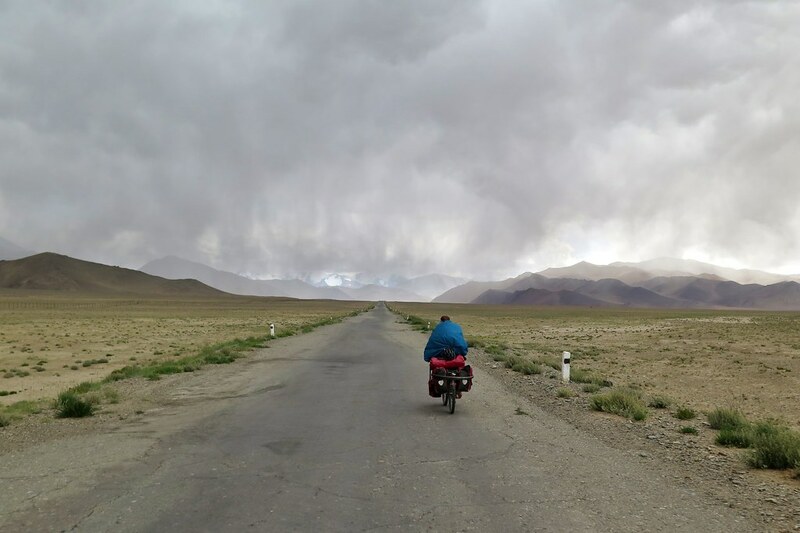 The clouds were closing in as we rolled into town and found our way to the Pamir Hotel, recommended by almost everyone we’d passed. 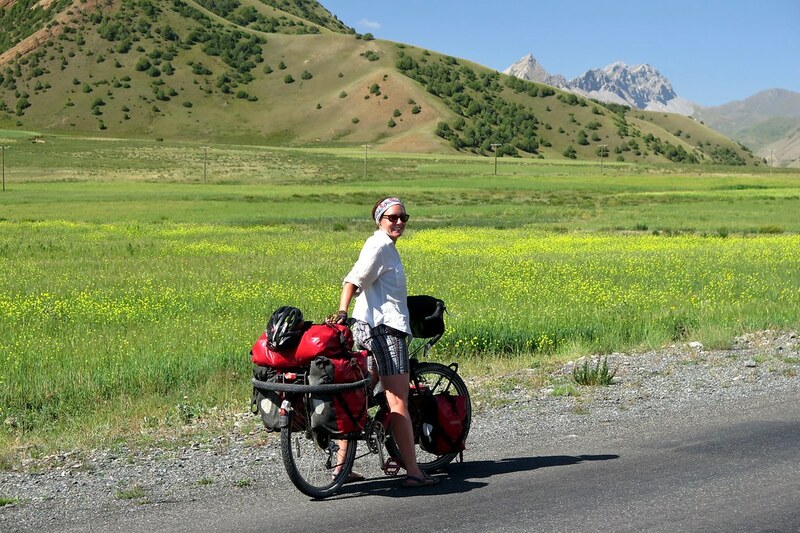 A nice double room, a shower and a good feed then a few beers with Tim and Claire, our French friends who we’d met and cycled with to Osh. So far, so (SO) good. A tough, but incredible few days that totally exceeded all expectations and hype. 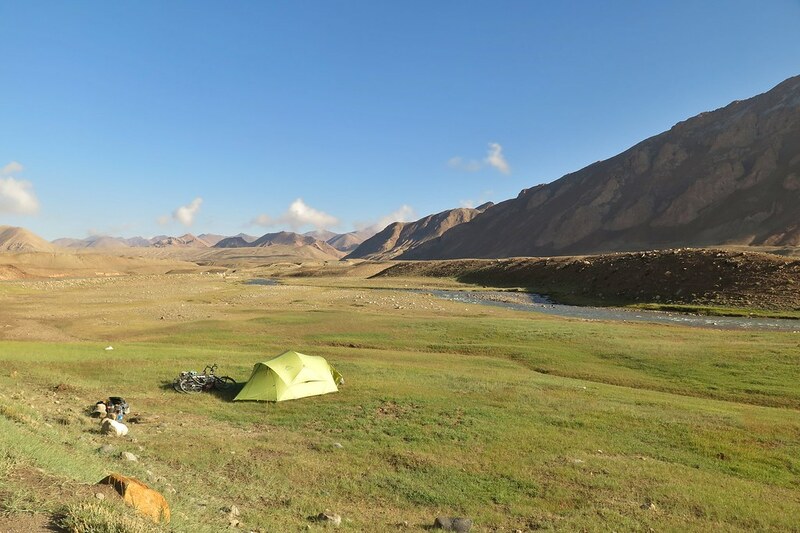 From here, we’ll be at high altitude for a couple more days before descending into the Wakhan Valley for the next stage, towards Khorog. 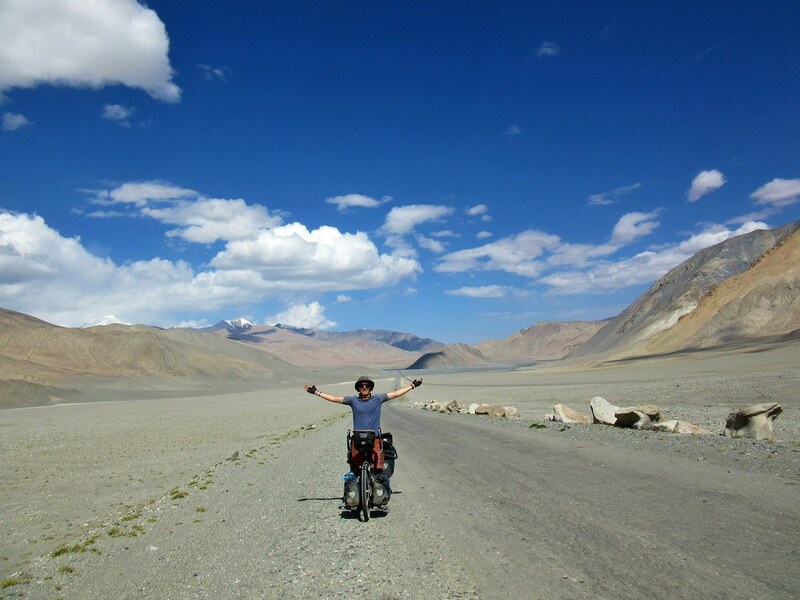 Another great blog, quite inspirational..though not to copy your efforts. I shall think of you when I tackle hills on my ride with Chris tomorrow! My goodness…. amazing pictures and writing. 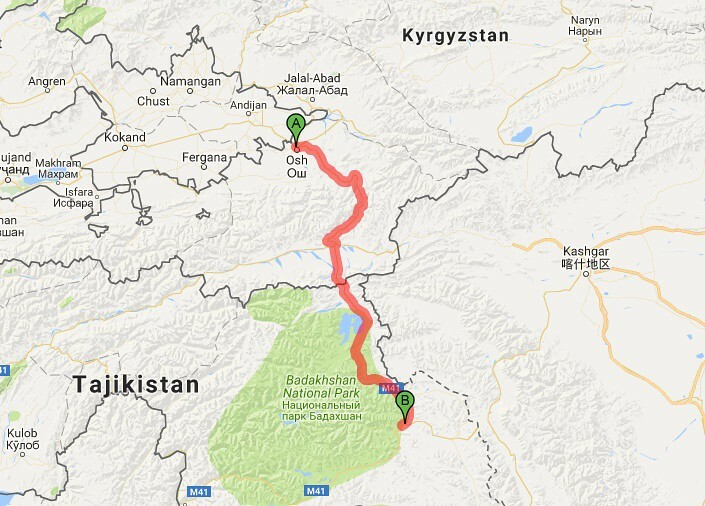 It is a dream of ours to do this route too. Keep on keeping on guys!! Thanks! If you get the chance, DO IT. Can’t recommend it enough! Hope you’re still loving Japan! Your blog gives me goosebumps just reading it! 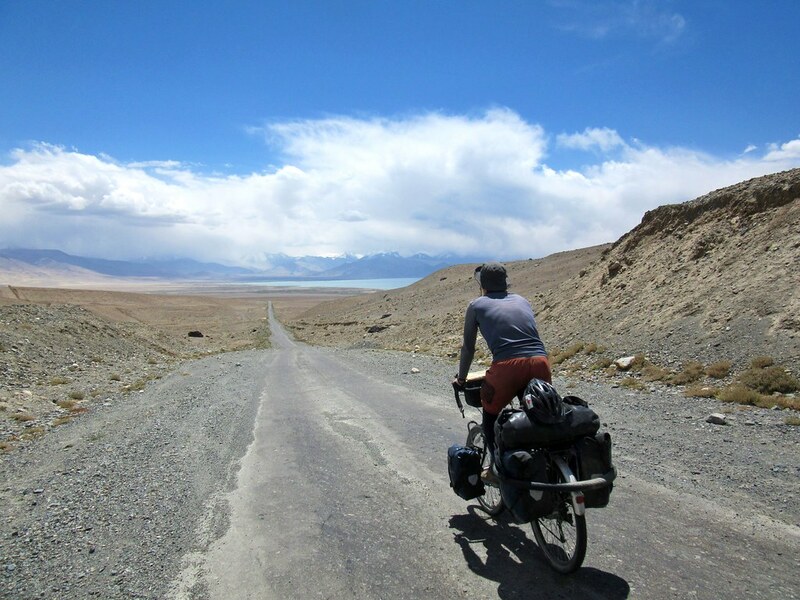 We are in Vietnam at the moment en route from NZ to Europe and desperately hoping we can make our money last long enough to to the Pamir highway after winter. The hot, populated places make me long for big, cold, isolated mountains. Thank you! Glad you enjoyed reading. Good luck with your trip! If you’re running short of cash, stopping off for a few months in China to teach English is a popular option! Will check out your blog and follow you! Love reading your experiences going the other way, guys. 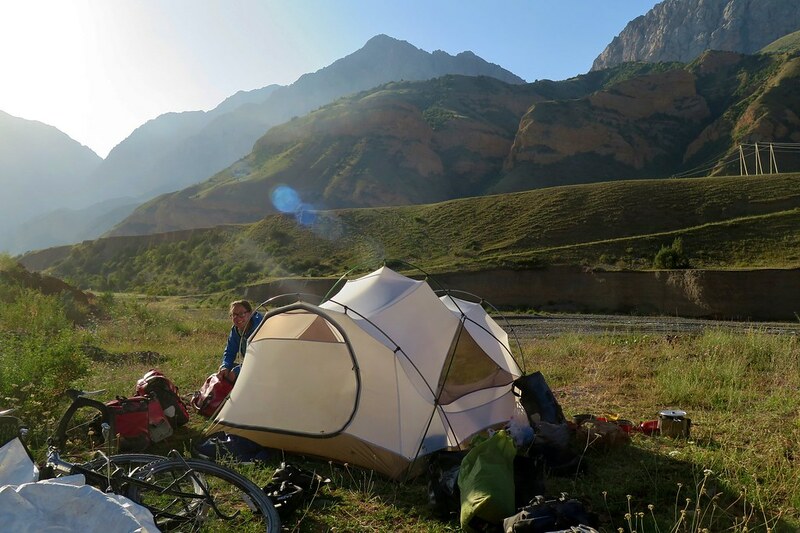 Looking at the photos from Tajikistan and Kyrgyzstan, I think we have camped in some very similar spots. It must be our excellent, collective sixth sense in finding great wild camping spots. What a fascinating trip–and your photos are incredible. That is truly a trip in a lifetime–and so well deserved. No time for quilting and embroidery!! Makes me wish we still had our Delica. 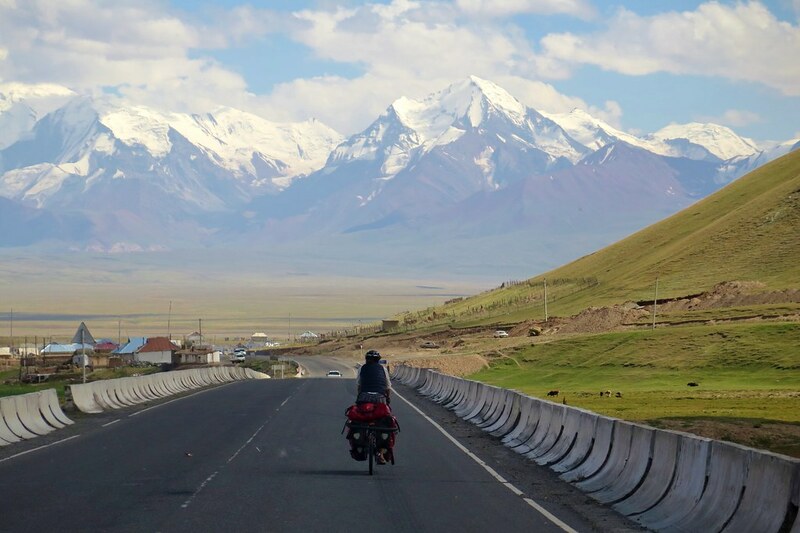 This seems like a beautiful stretch of the world – from the comfort of a 4WD van! Would be really cool to do in a van. We saw a fair few Delicas there actually!